Forking out roughly 9 grand for an elliptical trainer may sound like a crazy idea but that is only if you don’t check out what you get in return. Precor AMT 835 is like a breath of fresh air; it’s perched right on the cutting edge of recent workout technology and brings an experience like no other. Ever thought if it’s possible to enjoy the benefits of an elliptical trainer, a treadmill, and a stepper all from a single machine? Well, that’s what you get from this machine but that’s not all, the best is yet to come. With your exertion, you can control your height and stride length and even be able to change the motion at will. You are not confined to a set of motion. There’s still even more, which we’ve fortunately unpacked in our review including the machine’s dark side. 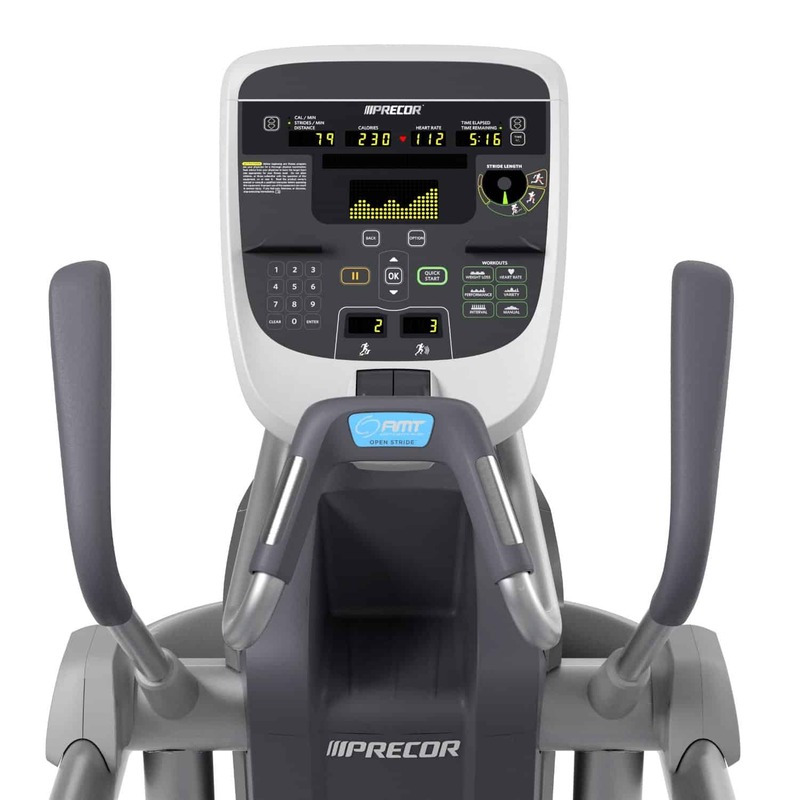 If you ever decide that you want to own the best elliptical machine ever without caring how much it costs, Precor AMT 835 is a machine you will want to consider. With this machine, you will have extremely diverse workout options and an experience that no elliptical machine below its class can offer. Durability and reliability are guaranteed and you will also be lucky to be an owner of a serious gym-class fitness machine if you ever decide to buy it. So are you ready to fork out 9 grand in exchange for this fine piece of engineering? Well, make your way to Amazon and place your order today. 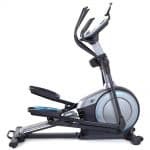 The AMT 835 is exactly that kind of commercial grade elliptical trainer you will find in a decent fitness center. Besides, it has award winning design features and packs a lot more that you won’t see anywhere around an ordinary elliptical trainer. To start you off, here’s a look at how it operates. Not so much information has been put out by the manufacturer concerning the machine’s resistance system but what’s available is that it utilizes a magnetic resistance system and packs 20 levels of resistance adjustable from the machine’s console. For the lower resistance level, the SPM (stride per minute) is at 60 while at the highest resistance level, the SPM is at 120. For the incline, you have a range of between 13-40 degrees which is pretty diverse and perfect for low and intense workouts. 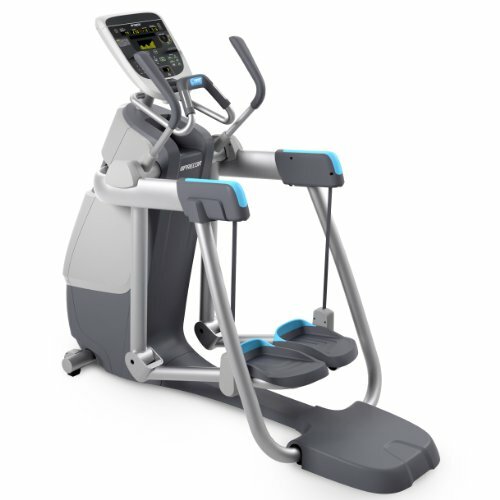 The display technology, programming, and other amenities included on this machine’s console make it one of the most advanced and intelligent consoles you will ever see on an elliptical machine. Even though the console looks sophisticated, using the controls is so easy and the menus are even the easiest to navigate. One unique addition to this console is the stride dial. It’s a visual indicator that helps to keep track of your stride length and also inform you about the muscle groups you will be targeting with your stride length. Also worth mentioning is that the console is telemetry enabled. This means you can use a chest strap to record your pulse rate. Each person who has ever owned this machine will agree that it’s of extraordinary quality. On top of being durable, it’s sturdy enough to take hard punishment. Seeing that it has a high user weight capacity, almost any person can start a workout regimen on it without fearing that it might break down. 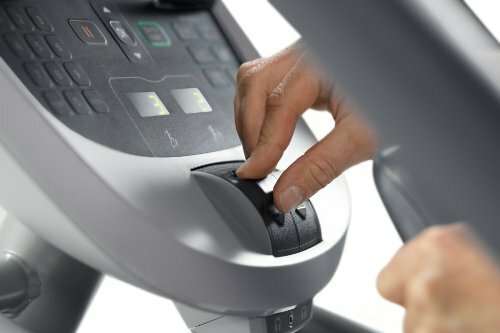 On design, every little feature that’s been packed into this machine to enhance its performance adds up to make one of the most amazing experience an elliptical can give. Top of them all is the open stride which offers an adjustable stride height (6.8-10″) and length (0-36”). All these features translate to the fact that a user can customize their workout anyway they want and have diverse workout options that can accommodate any level of training. Next is the adaptive stride length which enables one to naturally adapt the stride length without having to use the control settings. As we mentioned earlier, you can actually change the motion at will due to an infinite array of stride lengths. Changing instantly from long to short stride lengths or from running to walking is an easy task on this machine. On adjustability, this machine is the closest you will ever come to perfection. Precor AMT 835 is the epitome of comfort. Ergonomically speaking, AMT 935 is very great. It’s worth mentioning that the machine has been validated for people of all sizes, shapes and fitness levels by the Western Washington University Biomechanics Lab. If you have smaller hands, this machine will take care of you with its unique left and right grips that include 3 distinct positions. When exercising your lower body, the rodeo grip will offer enough stability. Transport wheels to enable movement. 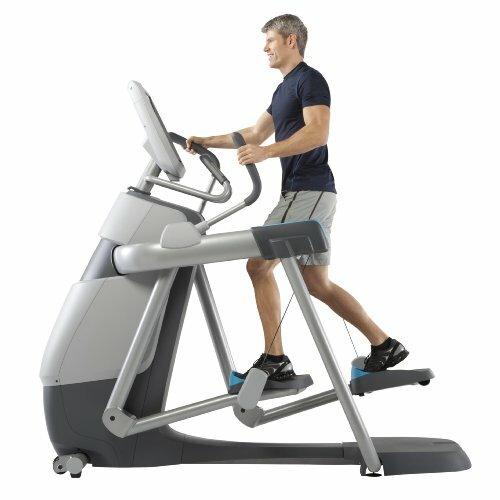 One great advantage that comes with purchasing Precor fitness machines is that all the assembly plus the installation is done by their own trained technicians. What this means is that the set up will be done in no time and you will start off your workouts as soon as you wish. Instead of including complex instructions and diagrams, their user manual thus comes with tips to help you get the most out of this machine. With the help of the manual, you will also be able to troubleshoot and diagnose any faults that may come up like error messages on the console and be able to fix them as quickly as possible. 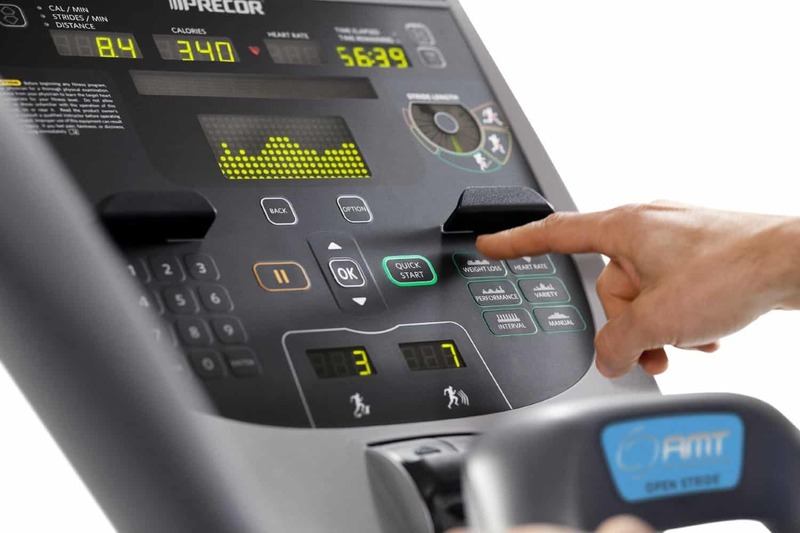 As for the weight, Precor AMT 835 can take users weighing up to 350lbs. At its exceptionally high price, it’s easy to conclude that Precor AMT 835 is in a league of its own but that’s far from right. Despite its huge price and use of cutting edge technology, this trainer still faces competition from other high-end elliptical trainers priced a little lower than it. 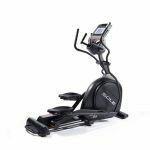 Sole E95 Elliptical trainer is a perfect example. 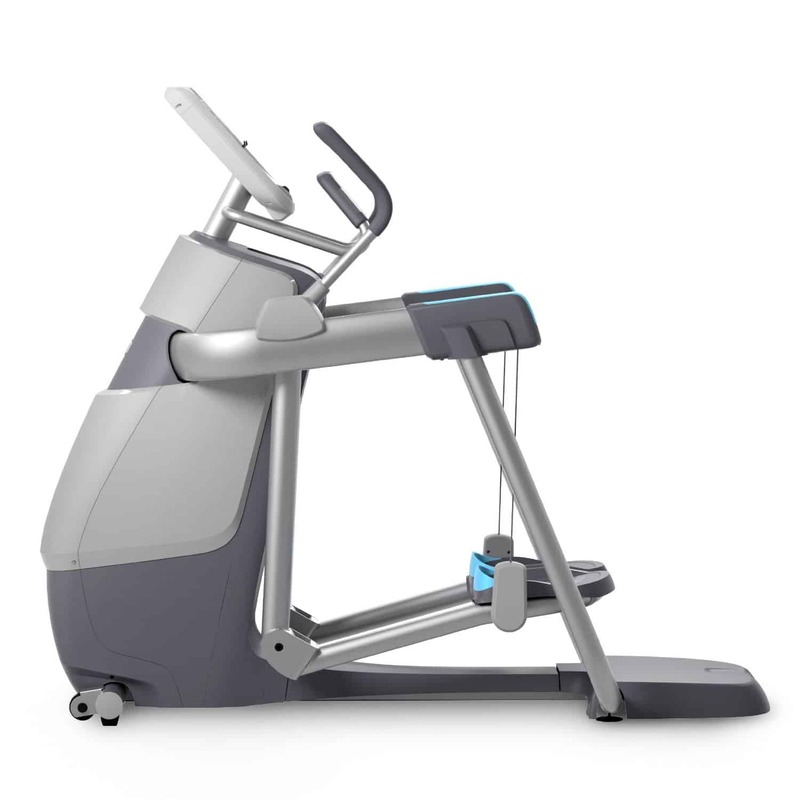 Sole E95 takes pride in having a power incline, an advanced sensor system, higher user weight capacity (400lbs), lifetime frame warranty, and more workout programs. Both share a number of similar features like telemetry enabled consoles and custom foot pedals. Precor AMT 835 appears more technology advanced than Sole E95 which can be justified by the huge price difference between them but when it comes down to solid workouts and performance, the two aren’t far apart.